If you haven't noticed already, the ticks are in full swing right now. Everyday I seem to come home with them and if you are hitting your balls into the tall grasses, you probably are too. Ticks look like the picture shown and aside from causing paranoia for the remainder of the day, they can cause some serious issues; most notably Lyme disease. 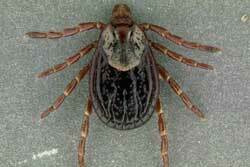 For more information regarding ticks and removing them, please visit the following link.